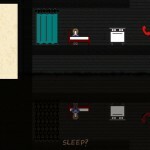 Last weekend I took part in the Global Game Jam at the SAE Institute in London. I will write a post-mortem on my submission in a seperate post (as I normally do), as well as perhaps upload a tweaked version at some unspecified time later. It was a fantastic experience and I’m really pleased that I had chance to take part. With over 100 people at the site it was a great atmosphere and I’m looking forward to it next year already. Further to the unveiling of the theme (“We don’t see things as they are, we see them as we are”), myself and Tom Smith decided to make a game about depression, and how it totally colours and influences the way that you see the world when you are in a low mood. Unfortunately, I’m having troubles uploading my game to the GGJ website. In the meantime, you can play it here. Liz Wright: Last minute graphics – everything that blatantly isn’t ‘programmer art’! My teams submission is here. The game is only a prototype and is a little rough around the edges, we spent a lot of time getting the camera system in Unity to create our split world feeling, and for it to scale appropriately when the dark and light sections got bigger and smaller. Up arrow to ‘do’ an activity. Basic instructions: Move around, complete activities, don’t allow yourself to get depressed. 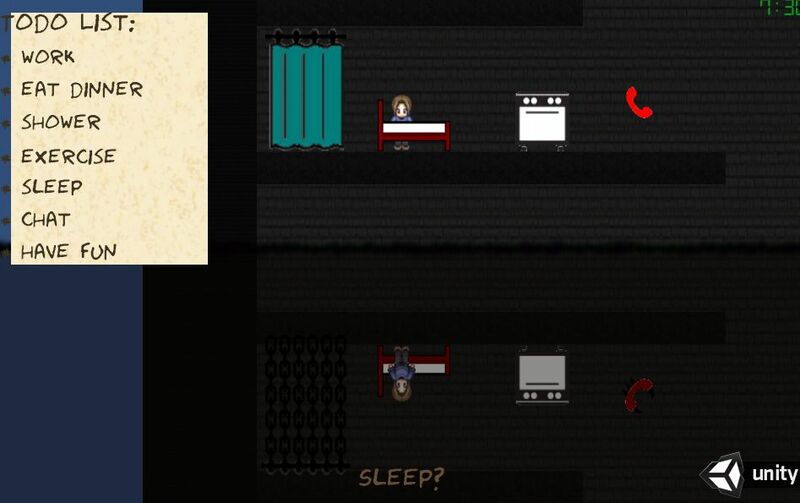 The game aims to illustrate the experience of having depression by use of a novel UI mechanic. The game takes place in the top half of the screen, and you start ‘happy’. Underneath the smouldering black line (particle effects by the way!) is what you would see if you are depressed. You see that activities that normally look normal become scary and less enticing when depressed, e.g. talking to a person becomes scarier and we represent this with devil horns, or the smiley face – which represents having fun or a hobby, becomes a blank grey face to illustrate that this loss of enjoyment during depression. What *could* happen is always visible, even if you’re in a ‘good mood’. The dark portion of the screen increases (on the bottom upon loading) as time goes by. When it reaches over halfway then the screen flips and the character is ‘depressed’. The negative versions of activities become their reality, although they can see how things could be if they were well. In addition to this, the structure of the game is used to illustrate ‘spoons theory‘. In short, this is a way of explaining that someone with mental health issues has only a certain amount of energy to use each day, and once that energy is used up, you can’t do anything more that day. Whilst it’s possible to ‘borrow’ spoons from other days, you are only borrowing against your allotment for the next day – where you will now have fewer spoons. The game does this by using energy costs and reimbursement values for each of the activities. All activities cost some energy but only some will give you back more energy as a result of doing them. For example, it takes a lot of energy to take exercise, but you get a little bit extra back because it’s good for your mental health. You see this in the UI in the way the middle line moves as energy is expended and then received back. Activities will also cost more if you are depressed, but your ‘return’ value will NOT increase. In doing this we aimed to illustrate how once you are in depression, it can be very difficult to work your way out of it. The prototype itself needs tweaking for energy values spent and gained, there needs to be a bigger game area, the movement needs to be worked on, and the screen is too dark. But I still feel it has the foundations of being an interesting game with more work on those core systems in the future. Play ‘The one about depression’ here.